What's my Staging Date for Automatic Enrolment of Workplace Pensions? Blog » Automatic Enrolment » What’s my Staging Date for Automatic Enrolment of Workplace Pensions? What’s my Staging Date for Automatic Enrolment of Workplace Pensions? By law over the next few years, all employers in the UK will need to provide their workers with access to a Workplace Pension. This is called ‘Automatic Enrolment’. The date your business needs to start complying with automatic enrolment is known as your ‘Staging Date’ and is based on the number of employees in your PAYE scheme at 1st April 2012. How do I know when my staging date is? The Pensions Regulator will write to you 12 months in advance and inform you the date you must start complying with automatic enrolment. (For businesses with 30 employees or fewer, your business will start to be phased in from 1st June 2015). However, The Pensions Regulator recommends that you spend 9-12 months preparing prior to your staging date so if you’re a small or micro business you should have started this process already. Where can I find out when my staging date is? You can check your ‘Staging Date’ on The Pensions Regulator Staging Date Tool (note: you will need your PAYE reference which can be located on a P6 / P9 coding notice. It can also be found on your white payslip booklet, P30BC). What if my business was setup after April 2012? If you setup your business after 1st April 2012, The Pensions Regulator’s Staging Date Tool may not be able to provide you with your staging date. If this is the case, they provide further guidance for employers who setup after 1st April 2012. 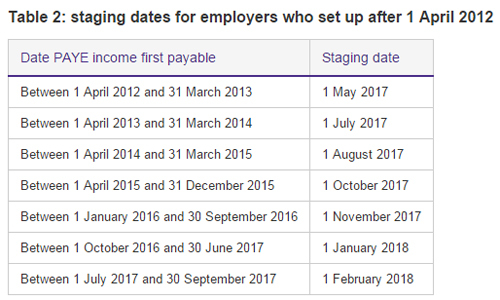 So for example if the date PAYE first become payable to HMRC fell between 1st April 2012 and 31st March 2013, your staging date will be 1st May 2017. Can I move the staging date for my business? Bringing your staging date forward – all employers are allowed to bring their staging date forward and you must inform The Pensions Regulator no later than one month in advance of your new staging date. How can Sage One Payroll help me prepare for automatic enrolment? We’ve prepared some great features to help your business get ready and prepared for automatic enrolment which you can read about in our previous blog ‘Sage One Payroll releases pre-staging Automatic Enrolment functionality’.